The best part is that you can do all of this without worrying about the integrity of your BSP data. The editor will keep track of what you're doing and will handle most situations automatically. 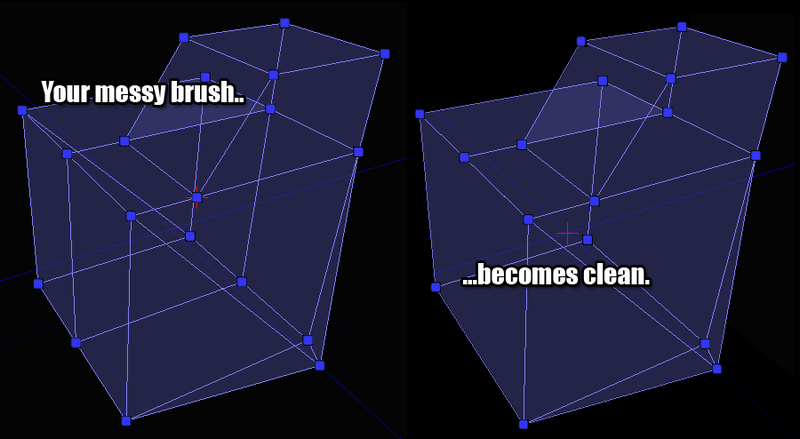 Collapsing a polygon will see it silently removed from the brush, moving a vertex off of a polygons plane will see that polygon automatically triangulated to compensate, etc. Geometry Mode gives you a lot of power but also offers a safety net. This document will give you the basic information you need to start using geometry mode. To enter geometry mode, select some brushes in your level and click the Geometry Mode button. 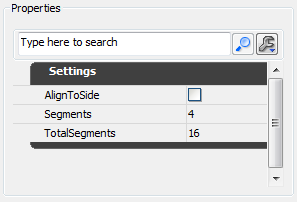 Once you're in geometry mode, you can click on whichever part of the selected objects interest you. 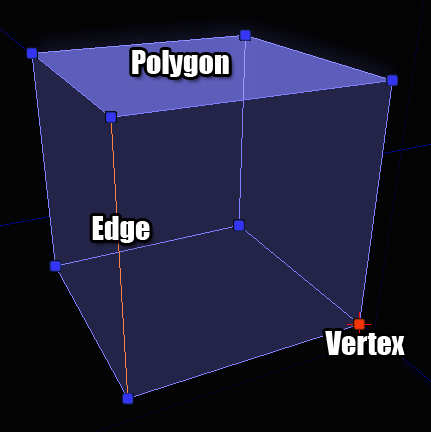 You can click on faces, edges or vertices. As you do, they highlight to show their selection state. All of these elements can be selected like any other object in UnrealEd - one at a time, in multiples, or in combinations. To edit your selections you can drag, rotate and scale them as you would anything else in UnrealEd. If you want to get fancier, you'll need to use modifiers. 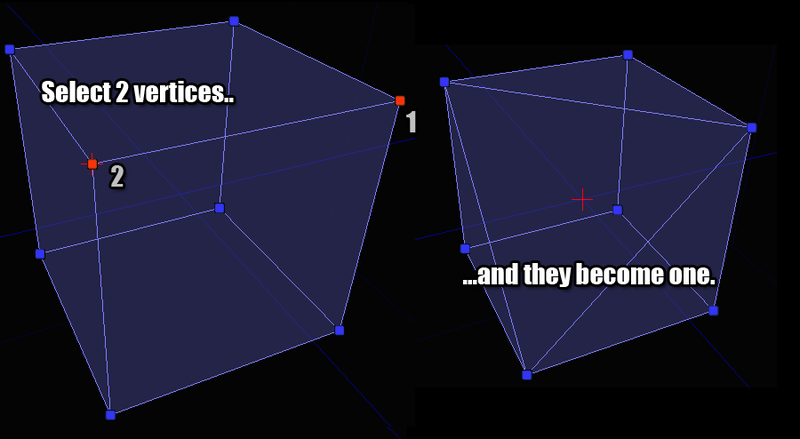 When you enter Geometry Mode you will be presented with a floating dialog box. This gives you access to the various modifiers that can be used to edit your geometry. Modifiers come in two flavors : active and passive. A passive modifier is one that requires you to interact with it to get it to do something. An active modifer is one that immediately acts on whatever is selected without you having to drag the mouse or something similar. 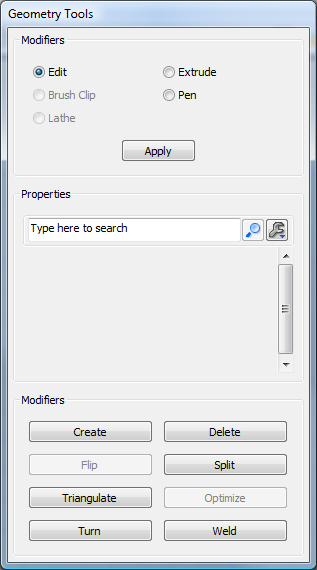 Passive modifiers appear at the top of the dialog, above the property window since they generally have parameters you can set to affect what the modifier does. Active modifiers appear at the bottom of the dialog since they are push buttons that don't need input or parameters. 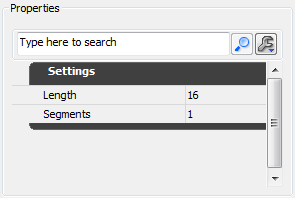 When you select a passive modifier the property window will change to reflect the settings for that modifier. 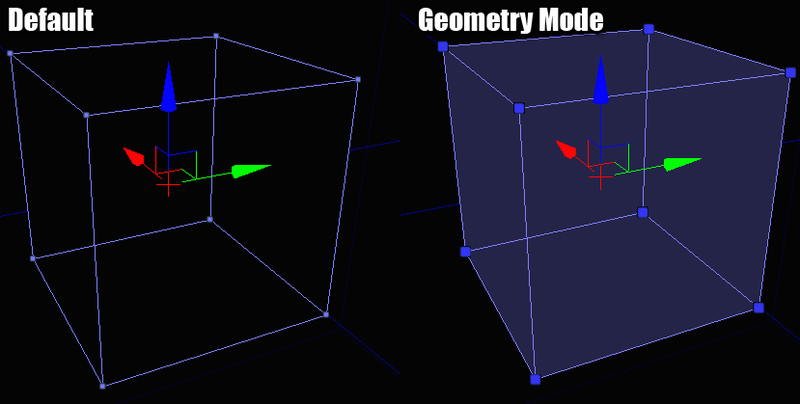 You can set it up the way you want, select some geometry objects and using the mouse to apply the modifier. Some allow you to click the "Apply" button if you want finer grained control over the results (dragging can be imprecise and just typing in numbers is sometimes better if you know exactly what you want to have happen). This is the default modifier in geometry mode and it basically represents the status quo. It won't do anything special to your selections. You can drag, rotate and scale your selections in this mode just like a regular actor in UnrealEd. 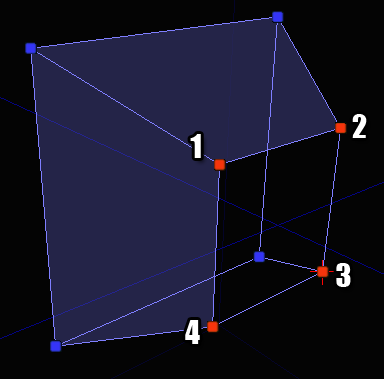 Moves the selected object forward, along its normal, creating new geometry behind it if necessary. Brush clipping is a quick way to cut pieces off of a brush or to split a brush into multiple brushes. The basic concept is that you define 2 anchor points in the viewport and when you perform the clip operation, that's the line that is used for clipping. Think of it as pushing a wire through a block of cheese. If you make a mistake when placing clip anchors, hitting ESCAPE will remove the last one you dropped down. The pen modifier allows you to draw a 2D shape in a freeform manner and then convert that shape into a brush. This is extremely useful for creating things like blocking volumes which need to be wrapped around a bunch of geometry. 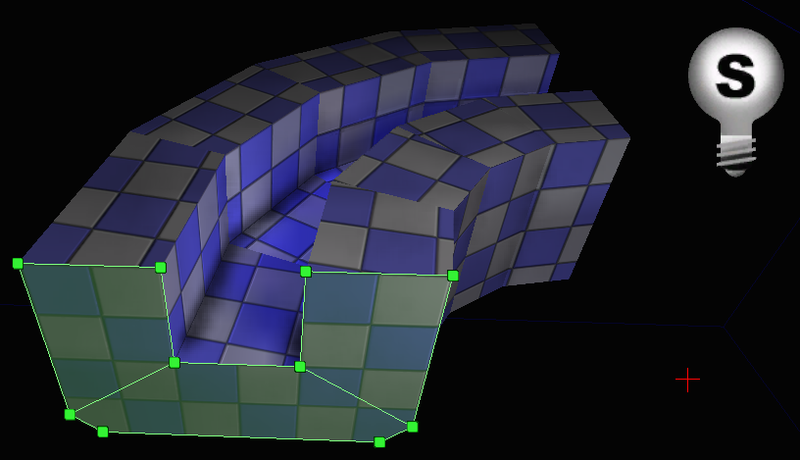 bAutoExtrude - If checked, the shape drawn will be extruded into a full brush. 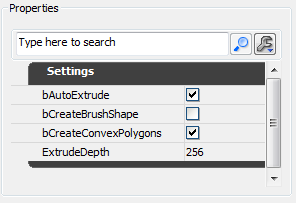 Leave this unchecked if you are trying to create a sheet brush. bCreateBrushShape - If checked, the result of the modifier will be a "brush shape" and not a "brush". Brush Shapes are used as templates for the Lathe modifier. 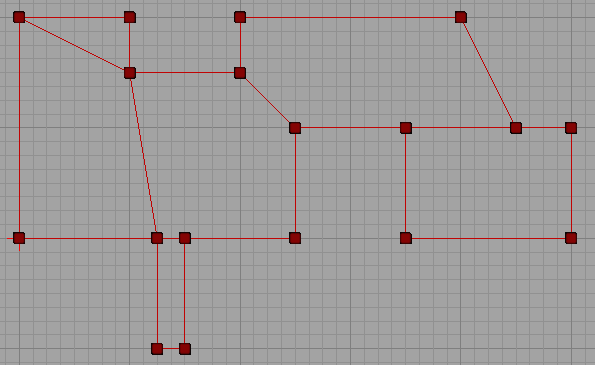 bCreateConvexPolygons - When the brush is created, the shape you draw needs to be broken down into triangles so that the polygons remain convex (something the Unreal Engine requires internally). 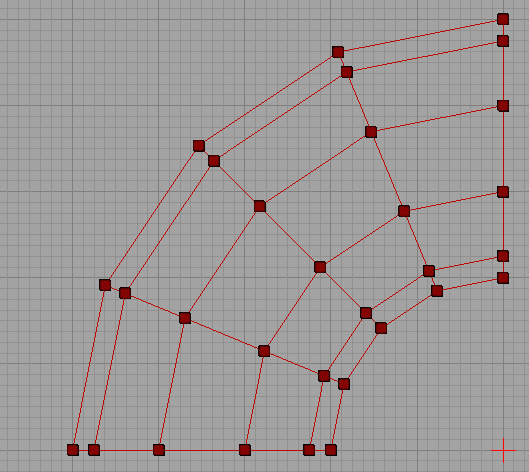 If this is checked, those triangles will be optimized into as few convex polygons as possible. ExtrudeDepth - If bAutoExtrude is checked then this field determines how deep of a brush is created. When you reach the end of your shape drawing, there are 2 ways to finish the shape and create your final brush. 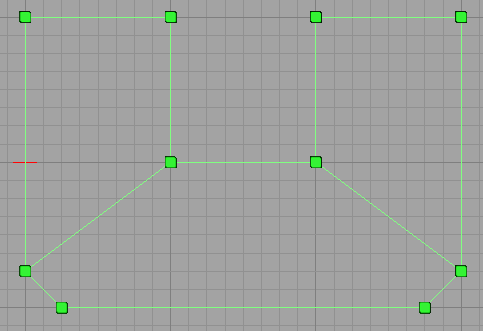 You can either place an anchor point on top of the first one that you placed, closing the shape. Or you can just press ENTER (the first and last anchors will be automatically connected for you). So you can see how this modifier would allow you to make some pretty complicated brushes and volumes with very little effort. Lathe allows you to take Brush Shapes (created via the Pen modifier) and revolve them around the pivot point to create curved brushes. 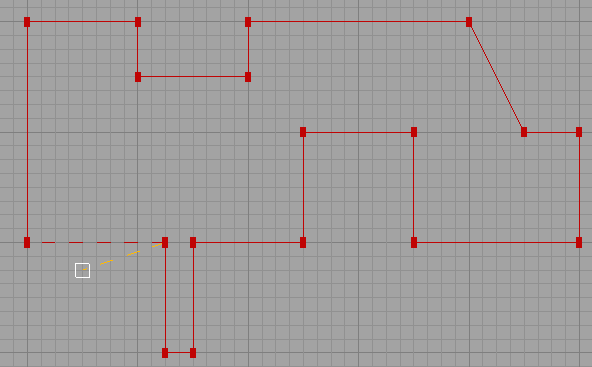 This is sort of like the old 2D shape editor functionality. AlignToSide - If checked, the resulting brush will rotated a half turn extra. This becomes more obvious if you play with it. Segments - How many segments you want to have in the resulting brush. TotalSegments - How many segments an entire rotation would contain. The segment fields are a little confusing but really very powerful. Say that you want a 90 degree turn with 4 segments in it. You would set Segments to 4 and TotalSegments to 16. See how that works? 90 degrees is a 1/4 of 360, so 4 segments requires a total of 16 segments to maintain that ratio. Explaining how to use this modifier requires a brief step back to the Pen modifier. To use the Lathe modifier you have to create a Brush Shape. You do this in the Pen modifier by creating a brush but having bCreateBrushShape checked. When you do that, your lines will turn light green to indicate that you are doing the right thing. You can create as many brush shapes in your level as you want to. They won't affect your BSP geometry at all and are used purely for the Lathe modifier. Once you have a shape selected and want to Lathe it, you need to do a few things. 1. Select the brush shape. 2. Place the pivot point somewhere beside the shape. This is important because the pivot point acts as the center of your rotation. Think of it as the center of your circle. There are a few ways to manually move the pivot point but the quickest is to point where you want it and hold down the ALT key while MIDDLE_CLICKING. 3. 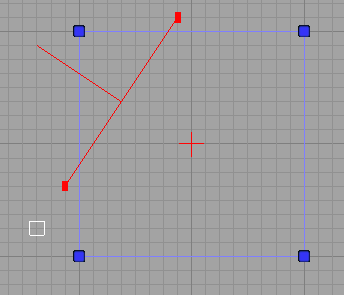 Make sure a viewport that has a top-down view of the shape is activated. You can clearly see here how the brush shape and the pivot work together to create the resulting brush. The brush shape can now be used elsewhere in the level or deleted. Deletes whatever you have selected from the source brush. 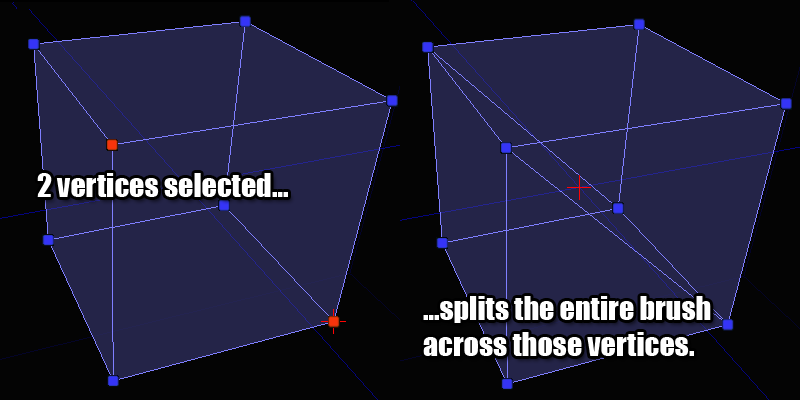 Note that if you delete something that multiple items depend on (like an edge or a vertex), the geometry will be collapsed to reflect this. Create is useful for those times when you create a hole in your object and need to plug it back up again. 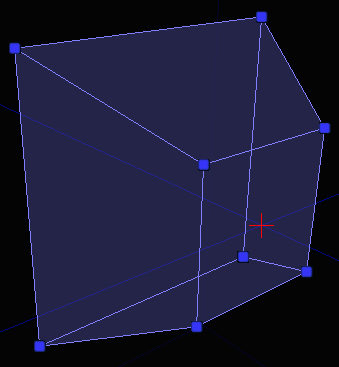 It creates new polygons from your set of selected vertices. It doesn't matter which vertex you start with but it does matter that you select them in clockwise order. 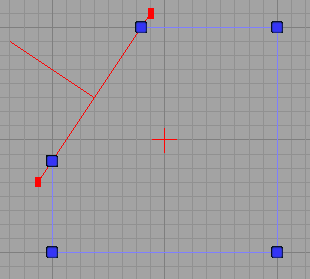 If you select them in counter-clockwise order nothing bad will happen but the polygon will be created backwards. You'll then have to use the Flip modifier to fix it. Flips the selected polygon so it faces the other way. This is useful for fixing brushes that have gone pear shaped for whatever reason or if you create a new polygon but select the vertices in the wrong order. Allows you to perform operations resembling "ring cut" and "scalpel" as they are often named in other 3D packages. Think of it as a specialized version of the Brush Clip modifier. If you don't have a valid combination of things selected, the split button will be disabled so refer to these pictures for the valid combinations if you get stuck. 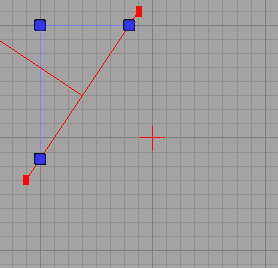 This modifier can be used to triangulate an object. 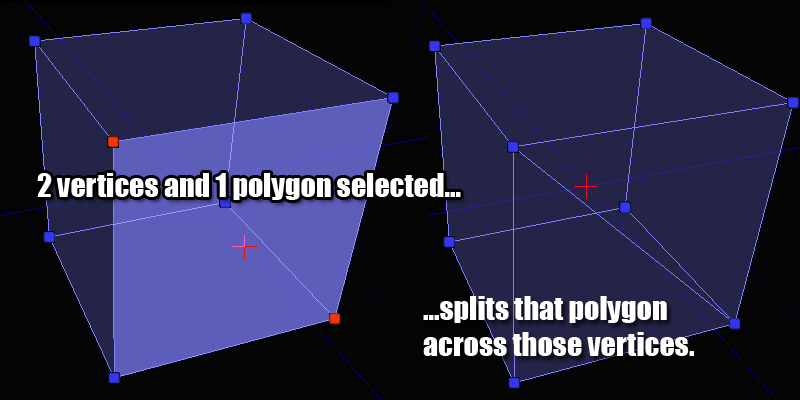 What that means is that the selected polygons will be broken down into triangles. This is sometimes useful if you want to have finer control over a brush. 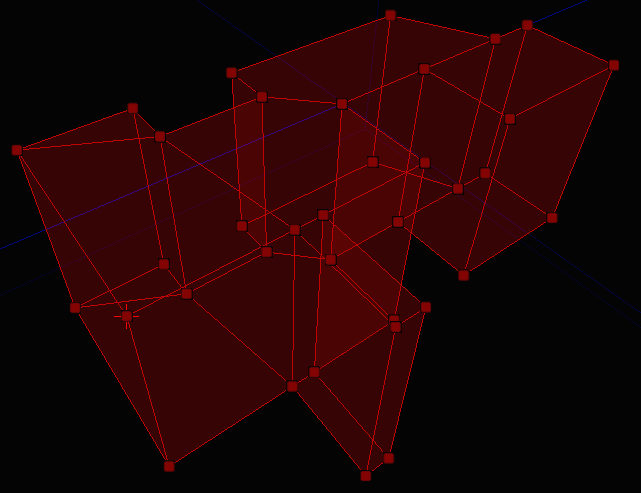 If you want to triangulate the entire brush, don't select any polygons beforehand. 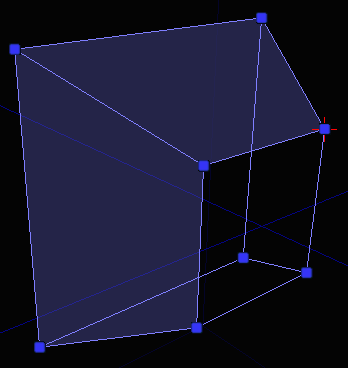 No polygons selected means "triangulate the entire brush". 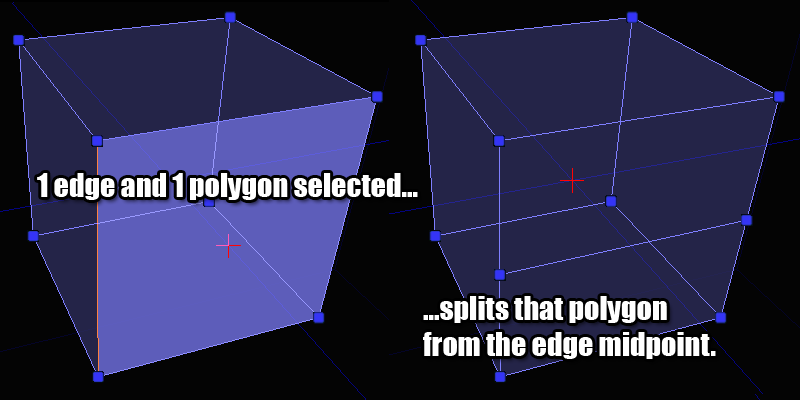 This modifier will look at the polygons you have selected (or the entire brush if no polygons are selected) and merge together polygons that can be formed into convex polygons. This is helpful for removing extra polygons from a brush that you have previously been doing a lot of splitting and triangulating on. 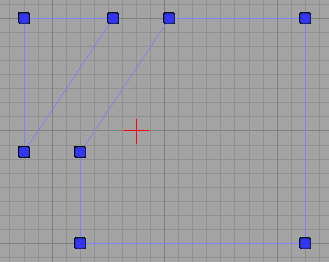 This is also a good fix for those times when you move a vertex in a weird way and the editor automatically triangulates the surrounding polygons. Once you have everything back in place, just click this button to clean up your brush. This modifier can be used to turn edges. 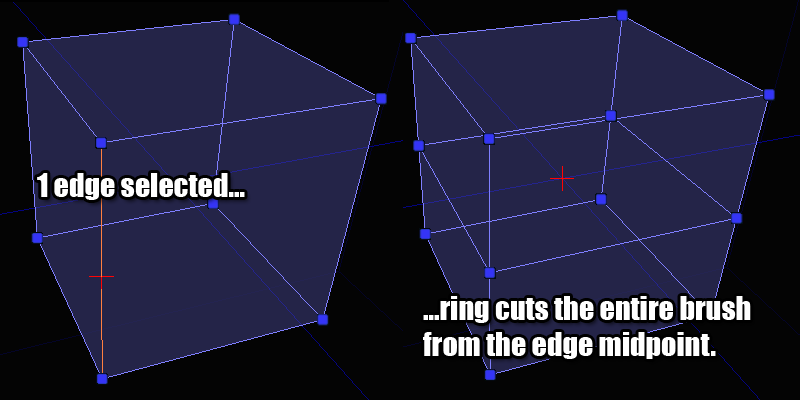 This modifier has a restriction that the polygons on either side of the the selected edge must be triangles since that's the only way that turning an edge makes logical sense. You can turn multiple edges at one time but be careful as this can sometimes lead to confusing results. This modifier can be used to weld vertices together. The same effect can be had by dragging vertices on top of each other, but this allows you to weld them quickly without worrying about trying to get them all lined up manually. Note in this example that the selection order matters. Vertex 2 will be welded into Vertex 1's location. 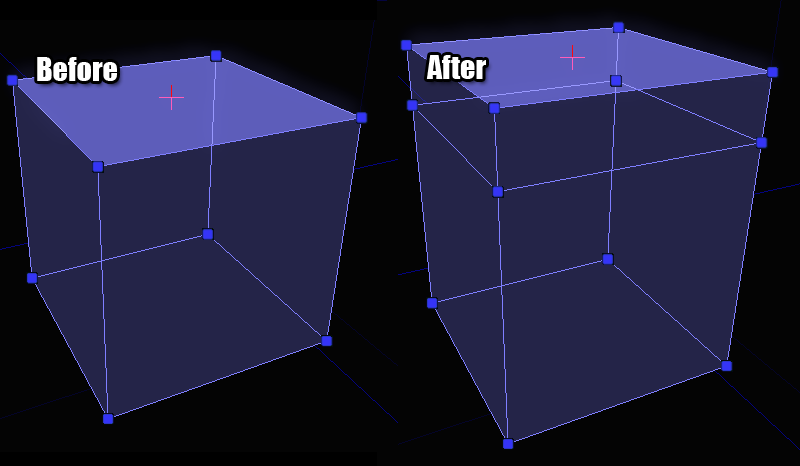 As you can see, geometry mode gives you more power over your BSP brushes than vertex editing could have ever hoped to. New modifiers will be added over time as the need arises for them, and they will be added to this document when that happens.